The MOTIONSTIM 8 is a versatile and freely programmable 8 channel stimulator designed for functional electrical stimulation (FES) as a supplemental therapy after impairments of the central nervous system (e.g. stroke or spinal cord injury). To achieve functional and orchestrated movements two stimulation channels are often not enough. 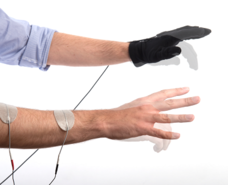 With the MOTIONSTIM 8 multi-channel stimulator complex movement patterns like grasping an object or standing up can be achieved easily and the use of up to 8 stimulation channels allows an efficient treatment of muscle atrophy. 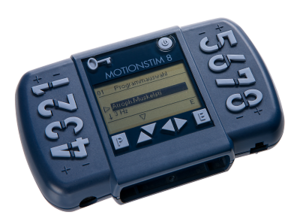 Sophisticated programs and innovative switch systems allow an intuitive control of the MOTIONSTIM 8, giving the user the possibility to be be in charge of the produced movement at any time for an effective compensation of motor impairments. 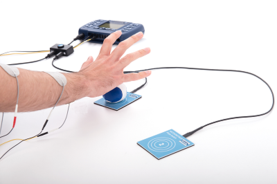 As a result of current and past projects, the MOTIONSTIM 8 can also be used for research activities with special modes of operation that enable the device to be completely controlled by a PC. For more information please contact us directly.